That said, I'm finding the readings at any given moment less indicative of actual conditions. For example the average wind speed one minute might be 17 then the next minute is 26. The moment when I actually open my browser would trivially make me believe two entirely different things about the actual current sailing conditions. I'm wondering if averages over 5-10 minutes are actually more useful to us than the every minute readings. Is anyone else thinking the same thing? The iW sensors around here seem to update in less than 15 minutes only if the average changes significantly. A couple of mph change = 15 minutes, but when we see an obvious drop or surge in the wind on the water, the sensor update may occur in one minute. That's useful in evaluating from afar whether and when and where it's time to drive. Each of those cliffs the wind falls over suggests a swim, big but brief surges imply a rigging frenzy for naught, etc. ... all factors in choosing sites and deciding when I'd rather mow the lawn. human catapult....you are right. I was driving to Crissy Sunday, it read 21....a few minutes later it was 14, I bailed . Then 5 mins later it was 22. I should have just ignored the thing. Posted: Thu Sep 13, 2012 10:46 am Post subject: 1 minute averages: The story. 1. During a 15 minute period there can great steady winds with some 1 minute averages being 18 mph to and other 1 minute averages being 22mph so the 15 minute average you see on the graphs would be 20 mph. 2. Or there could crappy quality wind with some one minute averages of 12 mph and other one minute averages of 28 mph. But the average 15 minute average you would see on the graph would still be 20 mph despite the extremely up and down wind. This is one reason why on some days a sensor seems very accurate when you hit the water and on other days a sensor seems way off. I know the 1 minute averages look really busy and are hard to interpret at first. The key is to NOT to focus on the just the most recent 1 minute average. Rather look at the trend of 1 minute averages over the last 20 minutes or so. This will allow you to deduce not just the wind average but also the wind quality much better than just looking at the 15 minute average and peak gust and lull. 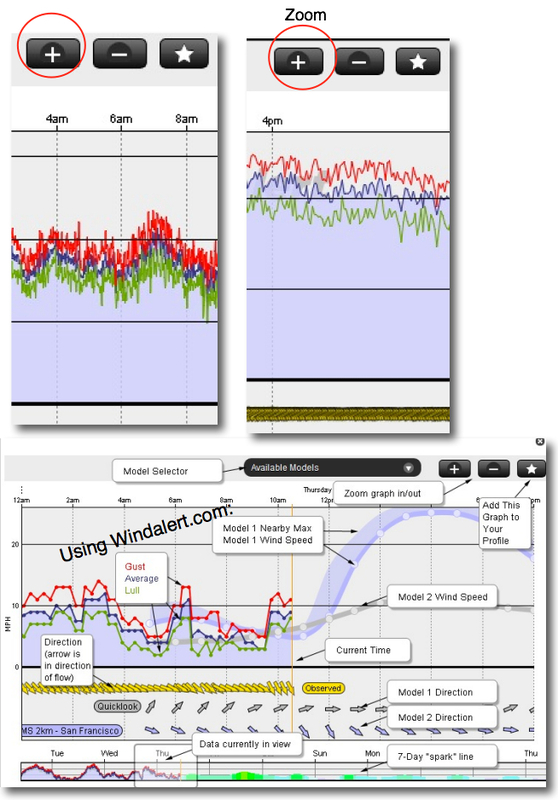 If you use windalert.com (below) you can zoom into the graph to really see the wind quality. Incidentally the one minute averages costs us more money. We are doing it for our America's Cup clients and only for Anita Rock, Pt. Diablo, Alcatraz, Point Blunt and Aquatic Park. For a tactician on one those boats 1 minute interval reports are invaluable. I expect we will revert those sensors to 15 minute intervals after the 2013 AC is over which will give you something to look forward to if you can to adapt to the information overload. If things go right we will have some awesome new sensors in the Crissy field area by the 2013 season. I, for one, appreciate the additional information we get from the 1-minute updates. I will be sad to see them go. However, they do increase the cognitive load in evaluating the wind at a glance. 1) Incorporate standard deviation (or some other measure of variance) into real-time measurements, perhaps over a 5 to 15 minute window. "Gust" and "Lull" used to be pretty useful here, but they are just as jittery as the average with the 1-minute updates. Similarly, gust and lull could be clamped over a 5 to 15 minute window. For standard deviation, you wouldn't have to report a numerical metric, just some visual cue as to the spread. This would help to identify crappy strong wind at a glance (as referenced in your post) without spending the time to load a graph and zoom in on it. Along those lines, anything you can do to reduce the cognitive load in evaluating the wind is helpful. You could display 5 to 15-minute rolling averages in any list-view of sites, while still showing real-time measurements when looking at a specific site or graph. 2) Incorporate a direction distribution (like the compass rose in the "Wind Statistics" panel for a site at WindAlert.com) into the real-time measurements. Crappy wind is often shifty rather than gusty. I typically look at IWS on my phone periodically while I'm *ahem* driving to the spot. The primary pages I use are the "Wind Obs Map" and the "Wind Obs Summary". Usually I just glance at the summary to make a decision about where I want to sail that day. As a windsurfer you know that the difference between 17 and 21 is huge, but I find that anita rock and TI both oscillate between these numbers with much frequency. I hardly ever look at each location's graph. I usually just look at the average on the summary then make a split second decision based upon that. I usually just look at the average on the summary then make a split second decision based upon that. Ditto. People asking me for gusts and lulls are frustrated by my shrug and "Dunno. Didn't look." First, it affects my sail size only if the holes and/or gusts are extreme and frequent. Second, all the numbers usually change significantly, sometimes dramatically, by the time I get rigged and dressed. Third, I'm going to rig big anyway for my first session to reduce the odds of having to slog or swim back after a reality check. Overpowered beats underpowered ALL to heck for that purpose, and decimal points are pretty useless for all three reasons. If the (wind-generated) swell looks appropriate to the wind's average speed, the wind is reasonably steady. If not, the wind either recently changed or is constantly changing. One could almost say that swell size indicates the average wind speed and whitecaps indicate the wind speed at that moment. Board, fin, and sail size are also often dependent on many other factors, such as time of day, wind shadow, sea state, and the penalty of rigging too small to plane. All that said, I'd very much appreciate more frequent updates *IF* it adds useful information. At present, with our local iW sensors, I believe that no update means the numbers haven't changed. If that's correct, I don't need to see 22G30 every moment. thanks for the tip on zooming in. Those graphs are impossible to read in "normal" mode. Also-this time of year pay attention to the gust number at Crissy or better yet ignore it completely. Wind in September can be reading 10 knots lighter at Anita than another 50 yards out.